President's Message: Ground Hog Sees His Shadow? Let’s hope that Mr. Groundhog sees his shadow so we can have an early spring. I am tired of the cold, gusty winds, snow and weather every two minutes in the new forecast. With the weather keeping us inside, now is the time for us all to sit down and write up a plan to get new members in our Granges. We talk at every meeting about getting new members but we don’t have a plan on paper. Let’s do this now that old man winter is keeping us indoors. 1) Communications - which includes transparency, and the return of the “New Grange” by email. 2) Financial Stability - we have a one million dollar loan for lawyer’s fees that needs to be paid off. 3) Membership – new members mean more money for National Grange, and less cost to State Granges. 4) Teamwork – this is between the National Grange office staff, committee directors and Grangers. I wish her well and offered her all the support that Connecticut can give her. Membership Director Joe Stefanoni was also there and stressed the importance of gaining new membership. We all need a plan and put it to work to increase our members, and remember our State Membership Committee is willing to help, all you need to do is ask. Brother Leroy Watson, of the National Grange Executive Committee, was there and he presented very interesting things coming from our Trademark litigations and Legal battle with the McFarland Group of the old California Grange. Trademarks of the Grange name- there is a staff member that monitors the Grange trademark and sends letters of noncompliance, or forwards to legal for further action. Music copyrights or royalties- If you hire a band for a concert, you must be covered with a policy for the use of copyright music. This also may include playing background music at events (with the exception of playing live radio in the background as stations take care of the copyright when they broadcast). The National Grange will be sending out requests to a number of Granges using live music, music events, music sponsored events to determine if the National Grange can assist with licensing, bonding or an umbrella policy to protect community Granges. This State Grange is also looking into a policy for this state. Use of the Grange name- The National Grange is looking into licensing, or charter Granges that use the Grange name. Example: the New England Grange Building, Inc. is a name by itself. No Grange owns it. So it can be viewed as a misuse of the Grange name. National Grange wants to work with these groups to either license or charter them so the Grange name can remain. This is being looked into for all uses of the Grange name. I don’t know if the group “Friends of the Grange” falls under this but they should see if they need the permission of the National Grange to retain this name. The New England Grange Building, Inc. had a great year at the Big E with over $26,000 in profits on the sale of jams, jellies and sewing goods. Grangers wanting to help in the salesroom, please contact me so we can get a list together. New paint and new columns made the building stand out and the Big E did a lot of landscaping to open up the area. We do need to address the lack of handicap access to the main floor and basement. The Trustees will be looking into this in April. We hope to have a plan to get done for this fair season. Reminder of the Pomona meeting on Feb. 28th at 2:00 P.M. at Cheshire Grange, please discuss this at your Community Granges and bring ideas and opinions as what to do with Pomona Granges. Your input is important to me so please come and attend. I am pleased to hear that people are collecting “G” dollars for the National Grange assessment. Your support will reduce the burden on our Granges if everyone helps out. The 2018 National Grange convention will be held somewhere in the Northeast. It was to be in held in Rhode Island. A hotel was found the cost of a location for the Seventh Degree may take it out of an acceptable price range. Vermont may be the final location. 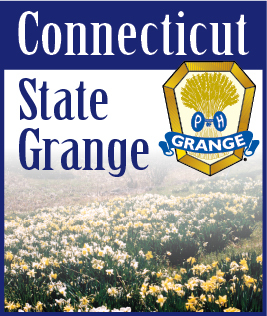 We have been informed that the commitment of each State Grange may be $4,500 each. So besides t-shirt sales, we need fundraising activities. If you have ideas, please let me know. I wish everyone a happy Valentine’s Day and please take that special person out and enjoy yourselves… and happy Presidents day.